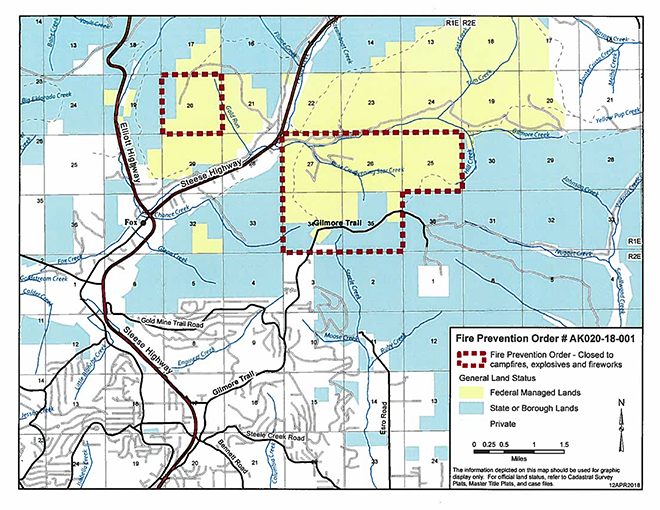 BLM lands identified for the Fire Prevention Order are colored yellow and fall within the red dotted line. Click on link noaapreventionorder2018 to view Fire Prevention Order and PDF map. FAIRBANKS, Alaska – The Bureau of Land Management (BLM) has issued a Fire Prevention Order prohibiting campfires, explosives and fireworks on federal lands in a fire-prone area of black spruce off of Gilmore Trail north of Fairbanks and north of the National Oceanic and Atmospheric Administration (NOAA) facility site on the Steese Highway. This is the third consecutive year the BLM’s Eastern Interior Field Office in Fairbanks has issued the order, which is intended to ensure public safety and protect nearby property and residences. This year a small section of public land at the end of Brier Road northeast of Fox is also included in the closure, which went into effect on May 3. In recent years, firefighters and law enforcement personnel have found numerous unattended bonfires on federal land off of Gilmore Trail, leading to concerns that an escaped fire could threaten local residences as well as the NOAA facility on Gilmore Creek. Anyone convicted of violating this order could face a fine of up to $1,000, could spend up to a year in jail and be responsible for costs associated with fire suppression and damages. The fire prevention order will end Oct. 31 unless it is rescinded as determined by conditions and human activity. The continued need for the Fire Prevention Order will be revisited at the end of the fire season. The BLM is also evaluating more long-term options for reducing wildfire hazards on federal lands in the area. For more information, contact Fire Management Specialist Tom St. Clair at 907-474-2226 or tstclair@blm.gov.